After six years of escalating misery, all of my cat's inflammatory bowel disease (IBD) symptoms disappeared - quite literally - within 24 hours of making the complete transition to a raw, grainless diet. That was nearly seven years ago and the symptoms did not not return. I know, I know, many people aren't going to take the time and trouble to seek out a balanced homemade diet recipe, double-check the research behind it, and spend weekends grinding whole chickens and rabbits for their cats. But some will. Ultimately, I came to the realization that I was putting my IBD cat at much greater risk by feeding species-inappropriate commercial foods than by feeding him a carefully-prepared, balanced, grain-free, raw meat-based diet. Interestingly, plenty of other folks I know with cats that have digestive troubles report this same experience. A grain-free diet "does the trick" for these IBD cats, but a raw diet with grains does not. Why is that? They're carnivores. The information on how to correctly prepare and serve a homemade diet is out there for the taking, but it requires a critical eye and a commitment to dig deep into justifications for every ingredient. The people in Canada who developed a splendid formulation called Feline Future (now TC Feline), for example, spent years culling through small animal nutrition handbooks, dissecting the nutritional content of a cat's natural prey, and conducting field trials to formulate raw-meat based recipe that closely mimics a natural prey diet for small cats. That makes good sense -why shouldn't we feed something to a cat that mimics a mouse? Some have gone further. A very gifted woman named Michelle Bernard published a fabulously well-researched book, Raising Cats Naturally, on how to care for cats the way nature intended. She's been feeding raw successfully to cats for over a decade, and carefully re-dissected the lay and veterinary research on feline nutrition to explain what constitutes a genuinely balanced and complete home-prepared diet for cats. The mainstream veterinary community's dismissal of homemade, and especially raw, diets out of hand because of a handful of noisy, irresponsible crackpots who are doling out ghastly advice is a poor substitute for not engaging in critical thought, reasoned debate, and unemotional discussion of a very serious issue. Gosh, vets should be in front of this issue. Leading. And teaching their clients about it if their clients have an interest. Right now they're playing catch-up. And frankly, many are playing catch-up pretty badly. One of the byproducts (pun intended) of this veterinary nutritional anarchy is that desperate animal caregivers can't turn to their vets. So they run a couple of cursory Internet searches on "natural diets" and maybe end up feeding some dangerously unbalanced homemade food and use aromatherapy to treat diabetes mellitus in cats. You know what I mean. Honestly, I don't think I'm too far off the mark when I suggest that vets have a responsibility to make nutritional knowledge a priority. Not a postscript that consists of selling a bag or can of overprocessed byproducts and species-inappropriate grain fillers formulated by an industry firstly answerable to shareholders, not animal caretakers. I don't regret taking the time and trouble to learn about feeding cats properly on my own, but the thousands of people who are subscribing to Internet groups these days seeking answers on feline nutrition portends a diminishing faith in the mainstream veterinary community. And trust me, some of the answers they're getting online aren't worth a plug nickel. So you're a vet, and if I come into your office (perish the thought, huh?) and you judge that I'm serious about wanting to try raw feeding, could you point me to information about the proper calcium-to-phosphorus ratio in the feline diet? This is a mighty big one that too many people who are new to raw feeding don't understand. I'd love it if more clients could have their vets hand them information on the precise mineral requirements of a cat and tell them which vitamins to use and in what proportions. The questions we have! Telling Clients That "Raw Feeding Can Be Dangerous" Is Not Enough. I wasn't cavalier about disregarding mainstream veterinary advice. Nor did I take admonitions about homemade feeding lightly. I did not carelessly plunge into feeding "any old diet" for my cat. I took the business of preparing cat food very seriously. I had trepidations about the idea to begin with. I read all the warnings on the pet food websites about the "dangers of raw." Believe me, I wanted to find an "answer" in a bag or a can. I wanted all that prescription food that my vet was selling me to work. But my sweet, sick cat was only getting sicker. And, as I learned from the hundreds of people who are members of the online feline IBD support group that I was honored to co-moderate for several years, my story was not at all unique. Correctly prepared and served, fresh raw diets - balanced fresh raw diets - are what Mother Nature designed these marvelous carnivores to eat. The raw diet that cured my cat of IBD is much like his diet would be if he had the ambition or incentive to hunt small prey. He may be a thoroughly domesticated feline hothouse orchid, but physiologically, he has never stopped being an obligate carnivore. The recipe I use is adapted from the original recipe developed by Feline Future (now TC Feline) and is discussed in greater detail in the book Raising Cats Naturally. Information on how to source the ingredients and safely prepare the diet is available in a number of places, including this very website. In the course of discussions and correspondence with various veterinary professionals, it's clear that the issue of home-prepared diets is a sore point for many. That said, as I and others discovered in battling feline IBD the key to helping many sick cats very often lies in feeding a species-appropriate diet. Although this point is absolutely central to understanding how it is that I cured my own marvelous cat, and how others did the same, I am saddened to find serious veterinary resistance both to this message and to its implications for how other chronically ill cats might benefit from dietary improvements that respect the unique requirements of an obligate carnivore. The standard rejoinder I heard years ago and continue to hear from many vets goes like this: many homemade diets, including all meat diets (whether raw or cooked), are "highly unbalanced and are likely to be deficient in key nutrients unless properly supplemented." You'll get no argument from me on that. I am also told that many veterinary nutritionists strongly discourage the use of raw diets for some very good reasons. Again, no disagreement there. No one in their right mind would feed an all meat diet to a cat. That would be horribly unbalanced. For starters, an all-meat diet would be much too high in phosphorus and dangerously low in calcium. The results for a cat would be disastrous. I can only applaud and encourage anyone, vet or lay person, who loudly and vehemently discourages anyone from feeding something so patently unsafe to a cat. But there is so very much more to the story. The customary response from vets, and certainly the pet food industry, about the possibility for raw diets to be dangerously unbalanced is a red herring. It distracts from the fundamental issue of advocating a balanced diet that is true to the carnivorous heritage of small cats. If the goal is to give a cat the best diet possible, then vague admonishments about the potential for homemade diets to be unbalanced are not enough. As things currently stand, the average vet knows that there are unbalanced homemade diets out there and simply defaults to endorsing a dry, commercial diet. But wait. But does s/he know exactly why and how it's unbalanced? Could s/he look at a recipe for homemade food and help a client to troubleshoot it to make it properly balanced? Or could the vet at least know which resources to suggest to a client to go dig deeper for the answers? I hear vets and pet food industry marketing specialists warn about the grave dangers from parasites and bacteria from feeding raw diets, but none explain to me with any defensible precision what the degree of that risk really is. No food that anyone feeds a cat is wholly without risk. 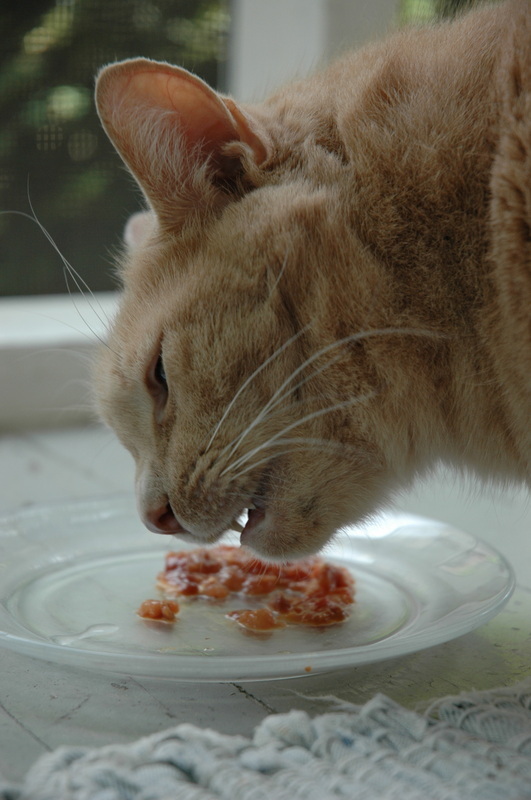 Cats can get Salmonella and E. coli from canned food too. After the pet food recall debacle in 2007, can anyone say with a straight face that feeding commercial food is "safe"? Responsible raw feeders take great pains to source meats from livestock that are free-range and are therefore less likely to come in contact with Salmonella. Trichinella from pork? That's simple. Raw feeders probably should worry about it. But to quote my mentor on raw feeding when I asked about trichinella poisoning from raw food: "Don't feed pork. No self-respecting cat would eat pig anyway." The food safety issue on raw feeding is discussed in considerably more detail on the FAQ page of this website. As for the often-cited concerns about the risks to people from handling raw diets for animals? This one leaves me stumped. Surely those of us preparing these diets aren't the only humans that have raw meat appear in the kitchen? In our house, we have a very firm rule that only the cats are permitted to eat the raw meat. And I'm fairly certain that I'm not the only one with access to hot soapy water and a dilute bleach or vinegar or hydrogen peroxide solution to thoroughly clean kitchen surfaces. When it comes to the litter box, observing sensible rules of basic hygiene is always in order. I know of so very many success stories from this diet from people who had nearly given up all hope for relief for these sweet IBD animals. Their cats were wasting away and the ever-increasing doses of prednisone were no longer working or had led to other health problems like diabetes. Like me, they came to feeding this diet because nothing else was working. More than once, people who already scheduled an appointment to euthanize their desperately ill cat were persuaded to try the raw diet as a last resort and were astonished to see their cats improve dramatically or even achieve an apparent cure with no medication. This is no joke. IBD most definitely is a curable disease in many, many cases. But it's never going to be cured if we keep putting the wrong fuel in a cat's digestive engine. If you're a veterinarian, please, please consider recommending this diet - with all the appropriate caveats about the wisdom of following a tested recipe to the letter - for your refractory IBD patients. What have you got to lose?